2 1/4" + 2 1/4" x 2"
Photograph taken on the lake at Child Beale park, Streatley, near Reading, England. Peter Turvey is based in London, England and is a member of the Steam Boat Association of great Britain. 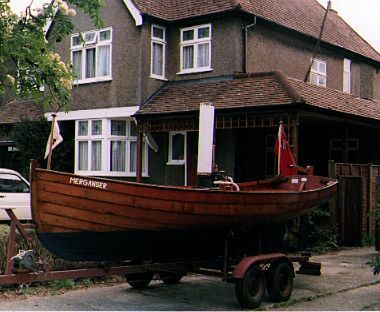 He and his wife owned the Winderemere steam launch Merganser in 1990. It is normally kept on river Thames near Walingford, Oxfordshire, England. It was built by Ian Cooper of Windermere in 1981 for the Canal Historian Edward Paget-Tomlinson. Hull is 18' by 5'3" beam, clinker, columbian pine on oak with cedar seats & transom. 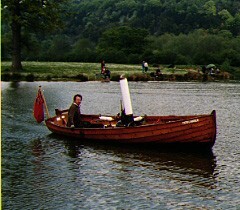 Engine & Boiler built & installed by Roger Mallinson of Windermere, 1981. 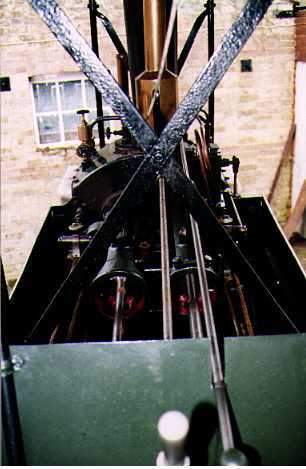 3-Drum coal-fired Blackstaffe-type water-tube boiler, working pressure 120psi, and Stuart "Swan" engine (two cylinders 2 1/4" bore by 2" stroke") with enlarged bearings and geared-down feed pump. Propellor by Roger Mallinson, narrow-bladed type,16" diamter by 24" pitch. Runs non-condensing taking water from river/lake through feed filters. Fitted with exhaust feed heater, injector, hand feed pump, and winderemere steam kettle. Seats 6 in comfort. 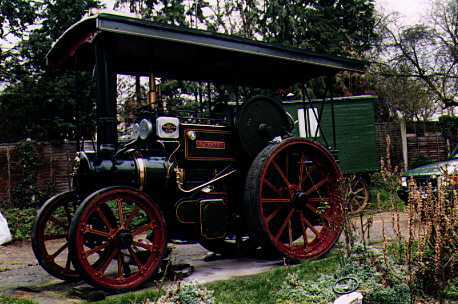 Mr. Peter Turvey also own a Steam Tractor (cheaper than building a big saloon launch, he told me). 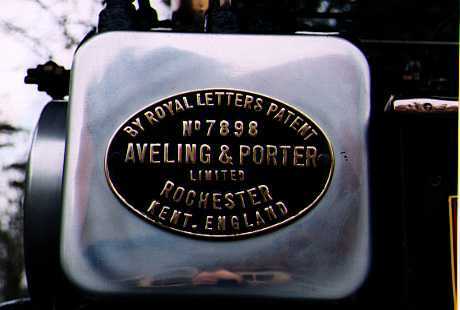 The 1913 Aveling & Porter Steam Motor Tractor No. 7898 Perhaps the ultimate tow vehicle for a trailable steam launch! A small (about the size of a landrover), light (approx 5 tons) steam road tractor which can be handled by one person. Built in 1913 for Essex County Council and used for hauling roadmaking materials. Sold by them in 1930, and bought for preservation in 1954 by the late Mr Les Smith, who described her restoration in Model Engineer 112, 1955, pps 114-115. (April 1955). 7898 was rebuilt again, with extensive boiler repairs, in 1994, and bought by us from Les Smith in April 1997. She can run at 10-12 miles per hour, and make a 60-70 mile trip in a day. Working pressure is 200psi. Compound cylinders. which is usually flying around at 600rpm as the Turvey's thunder along the road! The makers plate (A&P exported engines and steam rollers all over the world).